We’ve just put the shortlist for the 2018 Hilda Canter-Lund prize onto the BPS website and voting is now underway to determine the winners. 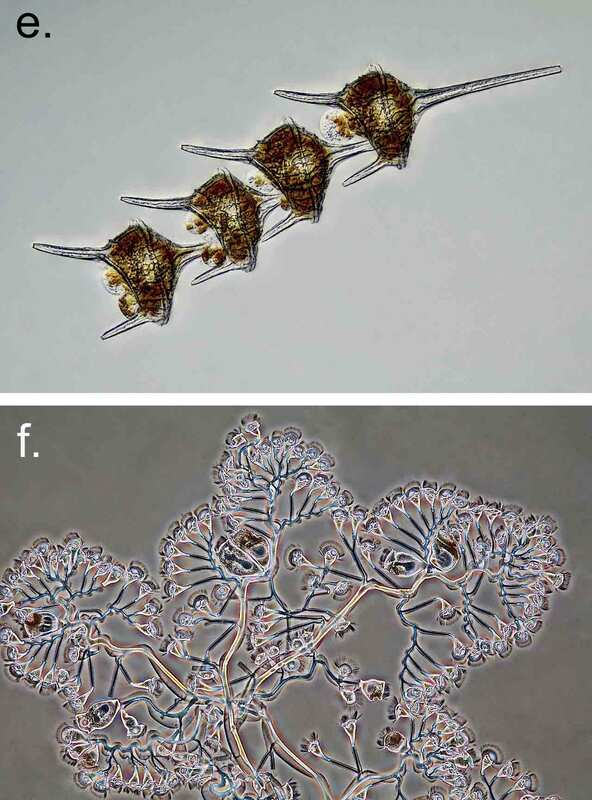 As in previous years, we had a lot of images of marine macroalgae and rather fewer of microalgae, which is a problem that I’ve tried to address in a few posts over the years (see, for example, “How to win the Hilda Canter-Lund competition (3)”. However, the best of the micrographs were stunning and two are included on the shortlist, though they have some stiff competition. I’ll go through the shortlisted images in alphabetical order. In each case, I have included a thumbnail, but you can see better quality images at http://www.brphycsoc.org/Canter_Lund_2018/index.lasso. Kristen Brown of the University of Queensland kicks off our shortlist with an image of the green alga Chlorodesmis fastigiata on top of a coral. 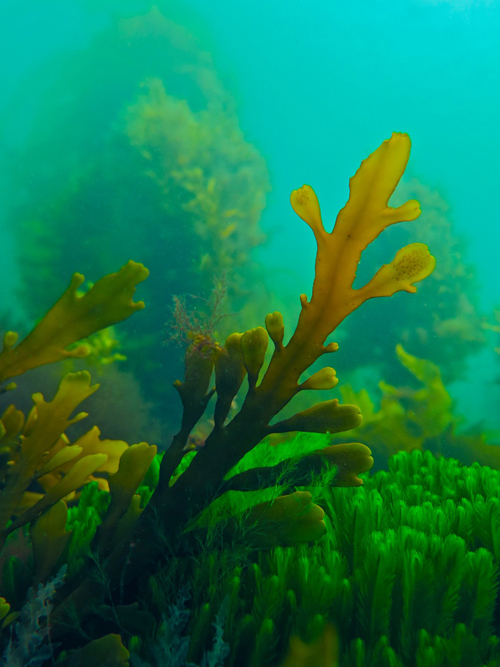 Like many of our shortlisted images over the years it has both aesthetic qualities and tells a story as interactions between macroalgae and coral are believed to play fundamental role in the degradation of coral reefs. Kristen is lucky enough to have a job that lets her dive on the Great Barrier Reef in Australia; our second shortlisted photographer, by contrast, dives in rather cooler waters. José M. Fariñas-Franco was returning from a dive off Aillwee, in the Connemara region, Ireland when he took his photograph of a floating kelp forest at high tide. The low light gives his image a particularly atmospheric appearance. The next two images are both by photographers who have appeared on Hilda Canter-Lund shortlists before: Karie Holterman and John Huisman. Karie Holterman, who was last on the shortlist in 2011, uses fluorescence microscopy to show cyanobacterial (blue-green algal) filaments growing amidst a mat of benthic diatoms from the bed of a lake in California. The chlorophyll in the diatoms fluouresces with a red colour whilst DNA in the cyanobacteria pigments has been stained with Syber Green 1 to highlight its DNA. The result is one of those intriguing images that crops up in the competition from time to time, balancing a fine line between representation and abstraction. 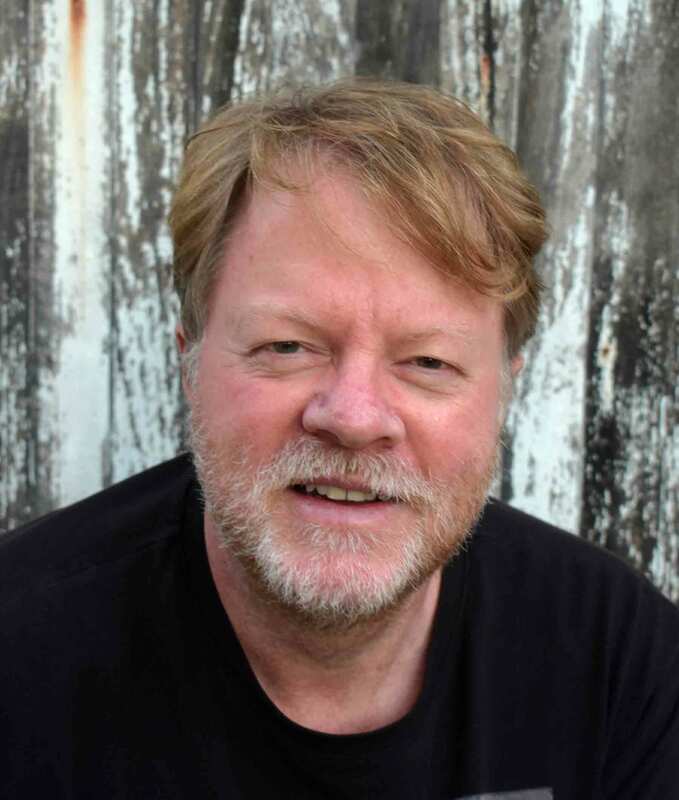 John Huisman is a regular fixture on the Hilda Canter-Lund shortlist, winning in 2014. 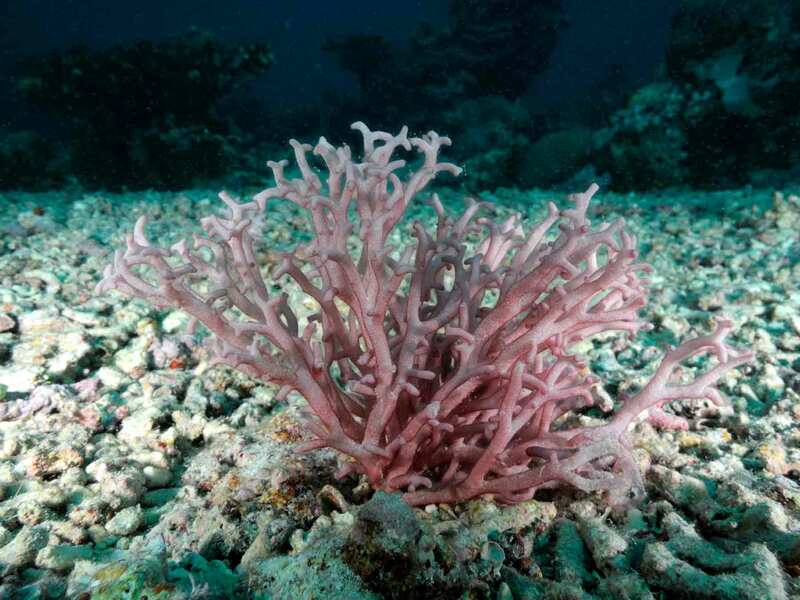 His entry this year takes us to a coral reef on the other side of Australia to the Great Barrier Reef and shows a calcified red alga, Ganonema, growing at a depth of 12 metres. We return to the microscopic world for our next image: a frond of cells of the diatom Licmophora found drifting in the Bay of Santander in northern Spain by Rafael Martín-Ledo of the University of Extremadura in Badajoz. 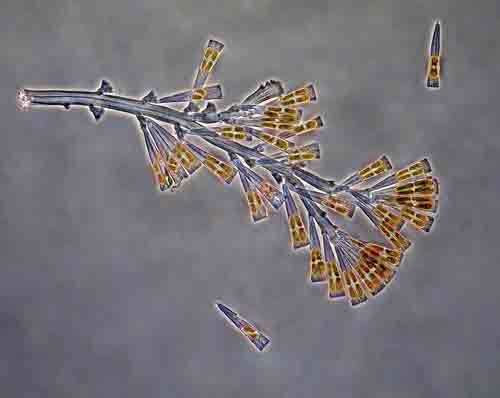 Licmophora is a diatom most often found as an epiphyte on seaweeds in the littoral zone but Rafael’s frond was free-floating, perhaps having become detached from its substratum. 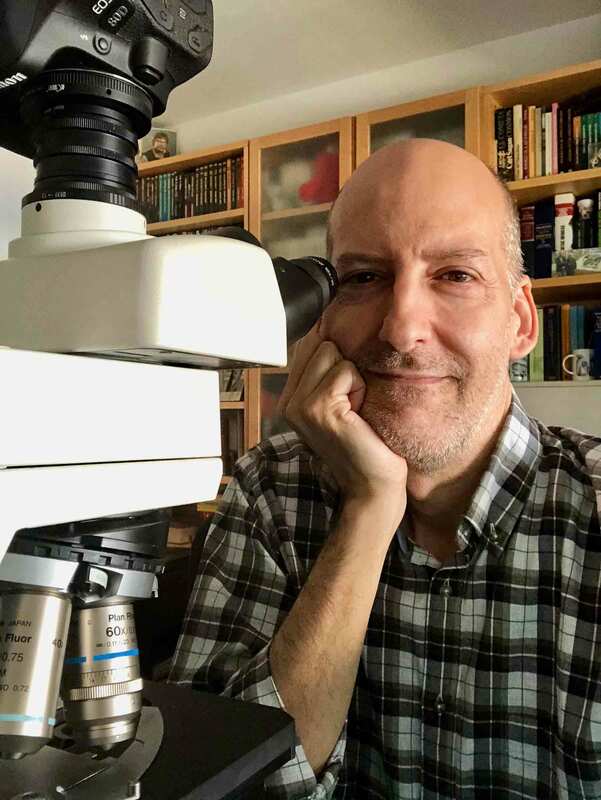 Rafael is a marine biologist whose interests stray well beyond algae and his Twitter feed (@martinledo) is well worth following for the wealth of beautiful images that he posts. And finally we have an image by another old friend of the competition, Leah Reidenbach (shortlisted in 2016). Leah’s photograph shows the green alga Ulva along with some mussels set against a background of pearl-white sand in the Bay of Fires Conservation Area in Tasmania. There is nothing particularly exciting about any of the components of this picture but Leah’s photograph captures these in a pleasing, semi-abstract arrangement. You may note one conspicuous absence from the shortlist this year: Chris Carter, who won in 2013 and 2017 and was shortlisted in 2010, 2011 and 2016 has now joined myself, Juliet Brodie and David Mann on the panel of judges who compile the shortlist. The final step will be for the BPS council to vote for the winner and that should take a couple of weeks, so keep an eye out on ALGAE-L and Twitter for an announcement before too long. Just a short post to point you all towards an article I wrote for Royal Society of Biology’s magazine The Biologist. It is a broad overview of the reasons why we use algae to assess the condition of our lakes and rivers in Europe and is illustrated with three of Chris Carter’s beautiful images, and the print edition will have even more of these. Take the figure legends with a pinch of salt (we didn’t write these! ): neither Tolypella nor Chaetophora are particularly common in the UK. Navicula, on the other hand, is common but the legend makes no mention of this. Whilst I have your attention, I will also point you towards a short article that I wrote for the most recent Phycological Bulletin, the newsletter of the Phycological Society of America. This offers a few more hints to anyone thinking about entering the Hilda Canter-Lund competition next year. 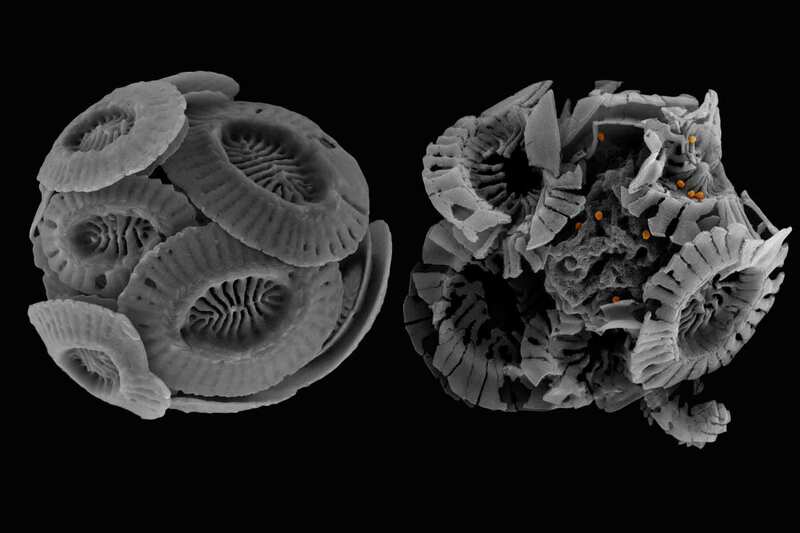 Daniella Schatz’ image of the coccolithophore Emiliania huxleyi is one of a relatively small number of electron micrographs to have made it to the shortlist of the Hilda Canter-Lund prize and, though not an outright winner, it offers some useful lessons to anyone considering submitting an image in next year’s competition. The first point to note is that Daniella has not submitted a single image, but a montage of two separate images. The competition rules state that “basic image enhancement (i.e. cropping, adjustment of contrast, colour balance etc) is permitted, along with focus stacking and stitching. However, excessive image manipulation is not acceptable.” “Excessive image manipulation” is not easy to define; however, Daniella’s montage worked for the judges because the two elements together tell a story about the life of this alga. 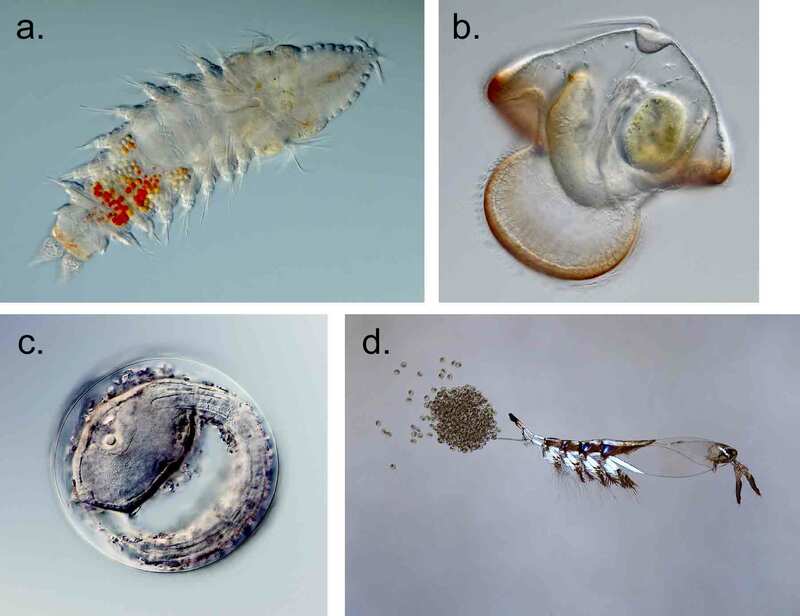 The left- and right-hand images are the “before” and “after” cases of a major factor controlling the ecology of Emiliania huxleyi. Daniella wanted to tell the story of the decline and fall of E. huxleyi blooms in the oceans; in the process she also evoked a long tradition of memento mori – artworks that remind viewers of their own mortality, and of the fragility of all life on earth. Another montage, this time by Alizée Mauffey, made it to the short list in 2017; again, the images were not selected and placed for aesthetic reasons, but to illustrate the range of functional traits within intertidal macroalgae. Daniella piles on a little more “image manipulation” by using false colour to highlight the tiny EhV201 virus cells that are scattered across the right hand cell and which are responsible for its sorry state. A couple of SEMs that have been enhanced by false colour are submitted each year but the artificiality of the medium rarely results in a major improvement to the image. The stark monochrome of SEMs places them in a long and noble tradition of black and white photography that should not need this type of enhancement. She, however, challenges this by using false colour very sparingly and to draw attention to an important element of her story. And so to the “story”: we now ask all entries to the competition to be accompanied by a legend of about 100 words explaining a little more about the picture. Most experienced phycologists will recognise the left hand image as a coccolithophore but many viewers will see these as abstract geometric shapes. The legend is important to help the viewer decode these shapes and place them into a broader context; in this case, by emphasising their role in global carbon cycling. Having said that, most of the shortlisting takes place without reference to the legend with initial screening based primarily on the quality of the images. I do remember, however, that Daniella’s image was one where we did need the legend in order to understand what she was trying to say. 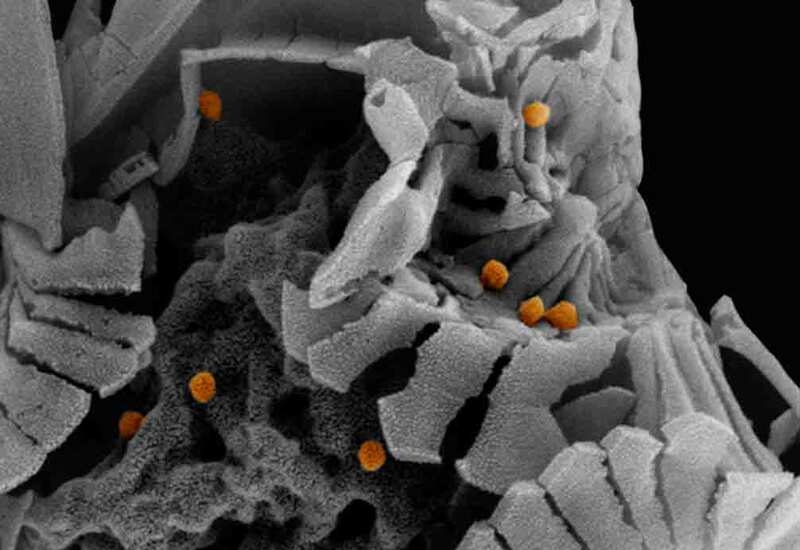 A detail from Daniella Schatz’ Scanning Electron Micrograph (SEM) of the coccolithophore Emiliania huxleyi showing the large dsDNA Emiliania huxleyi virus (EhV201, coloured orange). EhV is a large dsDNA virus that is responsible for the demise of vast oceanic blooms of E. huxleyi. During viral infection the cells undergo programmed cell death and shed their coccoliths, important components of the carbon cycle. The individual viruses are each about 100 nanometres (1/10000th of a millimetre) in diameter. We also encourage photographers, particularly those submitting microscopic images, to include a measure of scale in the legend, particularly for microscopic images. This is important, as lay audiences will have little idea about the size of the objects that are being portrayed. When images are used as illustrations, then a scale bar is appropriate (see “The stresses of summertime …” for a recent example); however, a scale bar is likely to be an unwelcome intrusion in an otherwise balanced composition so a sentence in the legend is usually more appropriate. Remember that the term “micrometre” might not be easily understood by many viewers, and it is a good idea to explain dimensions in millimetres as well. When the votes were counted in 2015, Daniella’s image lost out to Günter Forsterra’s stunning view of the Beagle Channel off the coast of Chile. However, it stands as a fine example of conceptual approach to the Hilda Canter-Lund competition – with several different elements combining to convey an idea that is more than the sum of its parts. The photographer of the microscopic world rarely has the luxury of the “decisive moment” and, instead, the quality of the final image often lies as much in post-production as it does in image capture.